Tooth bonding can also be used for teeth fillings instead of amalgam fillings. Many patients prefer bonding fillings because the white color is much less noticeable than the silver amalgam fillings. Bonding fillings can be used on front and back teeth depending on the location and extent of tooth decay. An implant is a new tooth made of metal and porcelain that looks just like your natural tooth. 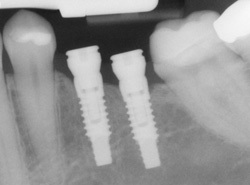 It's composed of two main parts: One part is the titanium implant body that takes the place of the missing root, and the second part is the tooth-colored crown that is cemented on top of the implant. With periodontal treatment, you can smile confidently knowing that no one will ever suspect you have a replacement tooth. In addition to tooth replacement, implants may be used to anchor dentures, especially lower dentures that tend to shift when you talk or chew. For patients with removable partial dentures, implants can replace missing teeth so that you have a more natural-looking smile.